Both cars are in desperate need of a few parts just to keep up with maintenance. 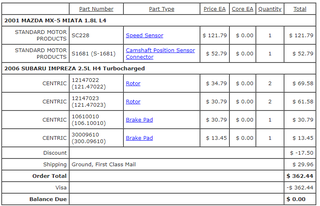 Of course the stupid electrical parts for the Miata cost way more than a full brake job on the STi. But they are absolutely necessary parts for me to pass smog in California. I finally got my stock header in last night so solving the check engine light(s) is the last step to making the car able to get Cali plates. My speedo does not work reliably and the camshaft position sensor always faults, even with a new sensor (changed it twice). So I will be grafting the new connector onto the car in order to get it to work right. Thankfully rockauto carries that stuff so I am good to go. The STi most definitely needs rotors, that much is apparent anytime I am heavily braking downhill. I have seen worse that people continue to drive around on, but I for one enjoy having perfectly functioning brakes. A car that stops reliably is the most important priority to me. Plus the pads are pretty low anyways so it is clear these rotors are probably pretty damn old, likely OEM since the car wasnt tracked. On the topic of brakes, the Miata still needs a brake caliper too (the rear right sticks sometimes and the bleeder screw siezed). But considering it did fine at a track day without falling apart, it can wait. On the short list of things to do though! Anyways, excited for a nice long drive up to SLO through fun routes only and a hike tomorrow on the Central Coast. Should be a good weekend.